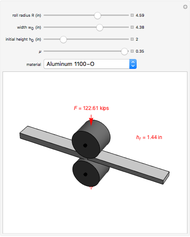 This Demonstration on the manufacturing process of flat rolling shows how roll radius, friction, and plate thickness determine the maximum change in plate thickness that can be achieved in a single pass through the rollers (maximum draft). It also calculates the force that has to be exerted by the rollers on the metal plate to achieve this draft. The kip is a non-SI unit of force equivalent to 1000 pounds-force. The maximum change in plate thickness that can be achieved in a single pass is given by: , where is the coefficient of friction between the rollers and the plate, is the roll diameter, is the original plate thickness, is the final plate thickness, and is the maximum draft. To calculate the draft, the first step is to determine the contact area between the roll and the plate by multiplying the plate width by the arc length of the roll contacting the plate, . Next, it is necessary to know the true strain and the average true stress of the plate, given by these equations: and . The variable is the strength coefficient of the material and is the work-hardening (or strain-hardening) coefficient. One of the issues in rolling lies in the fact that many materials get stronger as they are permanently deformed, thus requiring more force to continue deforming the material. The average true stress takes this into account. The equation for calculating roll force is then . To get the most out of this Demonstration, compare the roll force required for different materials and observe the effect that friction has on how much maximum draft can be achieved. S. Kalpakjian, Manufacturing Engineering and Technology, New York: Addison–Wesley, 1994. Sara McCaslin "Forces and Drafts in Flat Rolling"